Detection and Identification of Designer Drugs, the latest release in the Emerging Issues in Analytical Chemistry series, presents both an overview and a guide to techniques for anyone studying or engaging in designer drug analysis. Proliferation of the synthesis and use of designer drugs is a serious public health problem, with social, economic and legal implications. Whether abuse is studied at the population or individual level, researchers need both background and highly detailed technical information on specific drugs and drug classes in order to combat the proliferation and highly damaging consequences of these substances. 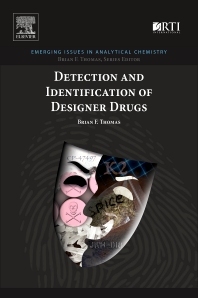 Author Brian F. Thomas provides a comprehensive discussion that emphasizes the potential threat to society, presents the ongoing challenges confronting the various laboratory approaches to detection and identification of new chemical entities, and informs on the development of improved analytical solutions for use in legislation, law enforcement and treatment. Brian F. Thomas, PhD, is Principal Scientist, Analytical Chemistry and Pharmaceutics, at RTI International, NC, USA. He has more than 20 years of experience in analytical chemistry and mass spectrometry. He is the principal investigator/co-principal investigator on two National Institute on Drug Abuse repository and purity specification contracts. His principal duties include overseeing the development of chromatographic assays and spectrophotometric assays for the qualitative and quantitative analysis of bulk chemicals or chemicals in dosage formulations, biological fluids, tissues, or other complex matrices. Dr. Thomas was recently awarded RTI’s President’s Award for his scientific contributions to the institute.